‘Yet the data show that manufacturing now accounts for a smaller slice of Ethiopia’s economy than at almost any point since the early 1980s.In 2015, the sector accounted for just 4.1 per cent of Ethiopia’s gross value added, well below the peak of 7.8 per cent in 1997, according to data from the World Bank, as the second chart shows. Moreover, manufacturing accounts for a smaller share of Ethiopia’s economy than that of virtually any other country in sub-Saharan Africa. South Africa, Kenya, Ivory Coast, Cameroon, Benin, Malawi, Mozambique and even Zimbabwe all generate at least 10 per cent of their gross value-added from manufacturing, with the likes of Nigeria and Uganda not far behind, as the third chart shows. Across sub-Saharan Africa as a whole, 10.6 per cent of continental GVA emanates from the sector, according to the World Bank, raising the question as to why Ethiopia is seen as one of the few African nations to have made a go of manufacturing. Ethiopia’s success in attracting foreign manufacturers is often held up as a beacon of hope that sub-Saharan Africa, by far the poorest region on the planet, can follow the well-trodden development model that has allowed the rest of the world to become richer. Industrialisation has largely been the key to development elsewhere, allowing relatively unproductive subsistence agricultural workers to be absorbed by a rapidly growing manufacturing sector boasting far higher productivity. With China now slewing off lower valued-added manufacturing jobs in sectors such as textiles and basic electronics as wages rise rapidly in the Middle Kingdom, low-wage Africa has long been seen as a potential rival to the likes of Bangladesh and Vietnam for such jobs, as suggested by the first chart. While this has yet to happen on any meaningful scale — the continent accounts for just 1 per cent of global manufacturing output — Ethiopia has won plaudits for attracting Chinese, Turkish and US investment into garment and shoe factories, notably from Chinese shoemaker Huajian Group, which employs 4,000 people in an industrial park outside Addis Ababa, the capital. This had led to the country being described as a regional manufacturing powerhouse. Yet the data show that manufacturing now accounts for a smaller slice of Ethiopia’s economy than at almost any point since the early 1980s. In 2015, the sector accounted for just 4.1 per cent of Ethiopia’s gross value added, well below the peak of 7.8 per cent in 1997, according to data from the World Bank, as the second chart shows. Moreover, manufacturing accounts for a smaller share of Ethiopia’s economy than that of virtually any other country in sub-Saharan Africa. South Africa, Kenya, Ivory Coast, Cameroon, Benin, Malawi, Mozambique and even Zimbabwe all generate at least 10 per cent of their gross value-added from manufacturing, with the likes of Nigeria and Uganda not far behind, as the third chart shows. Across sub-Saharan Africa as a whole, 10.6 per cent of continental GVA emanates from the sector, according to the World Bank, raising the question as to why Ethiopia is seen as one of the few African nations to have made a go of manufacturing. Despite the hype, Ethiopia exported just $44m worth of shoes in 2015, for example, 0.25 per cent of those exported by Vietnam and less than the footwear exports of the cordwaining powerhouse that is El Salvador. The east African state’s entire exports of clothing and textiles are worth just a tenth of its coffee exports. Slightly more charitably, Mr Ashbourne does suggest that part of the “Ethiopia story” is that it has been more successful than many of its regional peers in attracting investment from “big brand names” from overseas. Moreover, while in some African states a fair chunk of manufacturing activity may be a byproduct of those countries’ primary sectors (eg oil refining in Nigeria, processing and packaging of agricultural products in Kenya), Ethiopia is instead producing “relatively high quality goods that are exported”. “It’s being pulled into these global supply chains, which is not common across Africa and is impressive. Exports have risen sharply, [Ethiopian manufacturing] does employ more people than it used to,” Mr Ashbourne adds, even if job growth since the turn of the century has been faster in areas such as construction, mining, transport and the public sector. Mr Robertson believes it is Ethiopia’s close links to China that has captured the world’s interest. This extends beyond investments such as that of Huajian and China’s funding of a $4.2bn, 470-mile rail line from Addis Ababa to the port of Djibouti, which opened this year. “What has captured the interest is this comparison with China,” says Mr Robertson. Whereas most African countries are pursuing a private sector-led development model, “Ethiopia has adopted the five-year plan, top-down approach that we have seen in China,” which focuses on rolling out infrastructure such as electricity provision first, then developing light manufacturing, followed by heavy industry. “People are saying China has grown for 30 years at a very fast pace with a top-down programme. Ethiopia has grown very fast for 10 years [around 11 per cent a year] with a top-down programme. [People] are jumping to the conclusion that Ethiopia is following [in terms of manufacturing growth] when it’s really not,” he adds. Ethiopia’s rapid economic growth since 2004 does, though, raise the question as to whether other sub-Saharan states, with their private sector-led, bottom-up development models, could or should follow its lead. Mr Robertson, for one, does not believe the likes of Nigeria would be well suited to the Ethiopian approach. Firstly, Ethiopia can manage a state-led process because it has a strong bureaucracy, something that is lacking in much of Africa but has developed in Ethiopia because the country “has a long history of relatively stable government dating back to 1270,” Mr Robertson says. Secondly, Nigerians are wealthier than Ethiopians and are used to far more freedom than a government-led, top-down economic model would permit, he argues. “It is being used as an example in Nigeria but I don’t think it will fit. [Nigerians] are too democratic, too free, too opinionated. Ethiopia has had this regime in place for 30 years and it’s working and they have shown a commitment to relatively low corruption. For visitors to Addis Ababa, the most noticeable impact of the crackdown is the complete lack of mobile internet and severe disruption to online services. Deloitte, the global advisory firm, has estimated the shutdown is costing the economy $500,000 a day. Diplomats warn that the government, dominated by the Tigray ethnic group which comprise just 6 per cent of the population, is not addressing the protesters’ underlying grievances of inequitable growth, lack of democracy and perceived rampant nepotism. The construction cranes towering above the building sites on Ras Abebe Aragay Street in central Addis Ababa are tangible evidence of Ethiopia’s lofty ambitions to transform its capital into a modern hub. In two years’ time this should become a boulevard of gleaming skyscrapers, home to leading banks and others attracted by Ethiopia’s state-led development model. And with sub-Saharan Africa’s only electric light rail network outside South Africa passing nearby, Addis Ababa will be able to project a much more developed image than any of its regional rivals. Foreign investors, notably from China, have this year ploughed $2.5bn into an economy that has experienced double-digit annual growth over most of the past decade. But behind the façade, cracks are appearing in the model that helped Ethiopia become one of Africa’s star economic performers. The consequence for the authoritarian government, which derives much of its legitimacy since taking power 25 years ago from delivering development in the absence of many basic freedoms, is unprecedented uncertainty, analysts say. 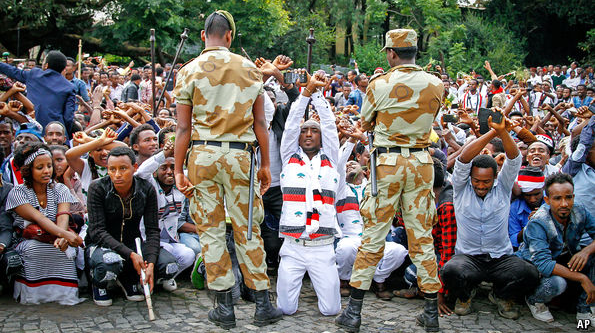 Ethiopia is in the third month of a state of emergency imposed to quell demonstrations against the regime, with hundreds of people killed in a brutal crackdown on protests that began more than a year ago. Foreign-owned businesses, particularly in textiles and flower farming, have been targeted in attacks that have caused tens of millions of dollars of damage. A few companies have left while others have put expansion plans on hold. Government promises of compensation for the damage have been extremely slow to materialise, adding to investors’ wariness. “By sacrificing rule-of-law and predictability to achieve short-term stability, the Ethiopian government has damaged its reputation by reinforcing the perception that it is more authoritarian than democratic,” said a western diplomat who engages with foreign companies. The country’s growing tourism industry has also been hit, with tour operators reporting lost earnings of $7m in the weeks after the state of emergency was imposed in October. Western governments have lifted travel advisories for most of the country but people in the hospitality industry predict it will take time for visitors to return. Roger Lee, chief executive of TAL, a Hong Kong-based company which produces clothes for brands such as Banana Republic, says despite the unrest, he would not be reversing the decision to open a factory in Hawassa, 275km south of Addis Ababa. The Ethiopian economy is still growing strongly — by 8 per cent this financial year according to official data. Although three percentage points lower than previously forecast it has come against the backdrop of a bad drought. The International Monetary Fund also predicts continued robust growth, driven by an industrial base that is set to expand as more infrastructure and low-cost manufacturing, much of it financed by China, come on stream. But there are also myriad worrying signs. The IMF warned in October that Ethiopia’s current account deficit, the amount by which imports exceed exports, “is not sustainable” at more than 10 per cent of gross domestic product for a second successive year. The resulting pressure on foreign exchange availability is adding to investors’ concerns. David Cowan, Citi’s chief Africa economist, believes the reality is worse and questions an IMF prediction that foreign direct investment will be $4.45bn in 2016-17, nearly $1bn more than its previous estimate. Many are also pessimistic about how the country can create enough jobs when non-Ethiopians continue to be banned from investing in the banking, telecom and retail sectors. A wave of anti-government protests and the imposition of a state of emergency has triggered a collapse in tourism bookings in Ethiopia, underlining the effect the unrest is having on one of Africa’s best-performing economies. As the demonstrations spread across the country, governments, including the US, UK, Australia, Canada and Ireland, have advised their citizens against all non-essential travel to the country or Amhara and Oromia regions at the centre of the instability. Hailemariam Desalegn, Ethiopia’s prime minister, has said the death toll from the demonstrations, which began last November and have been exacerbated by the authoritarian regime’s brutal crackdown on protesters, could be as high as 500. Thousands of people have been arrested and the government imposed a state of emergency as it grapples with the biggest threat to the Horn of Africa nation’s stability in years. The protests originally began over land disputes, but the state’s harsh response caused them to spiral into broader protests against the government. An American woman was killed after being caught up in a protest on the outskirts of Addis Ababa, the capital, this month. Travel companies said bookings to the country — home to ancient Christian sites and spectacular highlands — have virtually ground to halt as the unrest and travel warnings keep visitors away. Tourism has become an important part of the economy, which has been growing at an annual average of about 10 per cent over the past decade as Ethiopia has attracted increasing levels of foreign investment. The government estimates the sector contributes about 4.5 per cent of gross domestic product, or $2.9bn. The indirect contribution, through investment, is the same, while about 1.5m people are thought to earn their living from the industry. More than 750,000 foreign tourists visited Ethiopia last year, with the US by far the largest country of origin, followed by China, Britain and Germany, according to government data. The blow to tourism comes amid rising investor uncertainty as foreign companies, particularly flower farms and textile factories, have been targeted in a string of attacks that have caused tens of millions of dollars of damage. The International Monetary Fund warned just before the state of emergency was imposed this month that attracting foreign investment will be crucial to sustaining the high growth rates. Some travel companies said one problem is that while some of Ethiopia’s most popular sites — such as the city of Aksum — are not located in Amhara or Oromia, people have to travel through those regions to reach them. 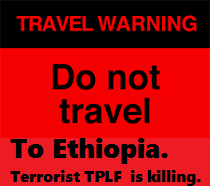 The Ethiopian Tourism Organisation, a government body, insisted that “all tourist areas of the country are safe”. “It is as safe now for tourists and business visitors to travel in Ethiopia as it has been for the last 22 years since the new constitution has been introduced,” it said in a statement. Kiros Mahari, the general manager of the Ethiopian Tour Operators Association, said that “while there has been some unrest for a while, the situation has been restored back to normal”. Emma Gordon, an analyst at Verisk Maplecroft, a risk consultancy, said such statements “come across as unbelievable”. Ms Gordon predicted that once the protesters had worked out how to cope with the state of emergency, which bans all protests, political communication on social media, and political gatherings, “there will be an upsurge in unrest”. 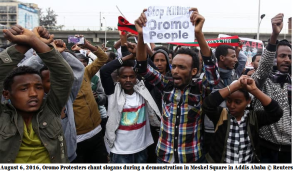 Analyst tells IBTimes UK grievances in Oromia ‘an old problem’ state of emergency might not be able to solve. 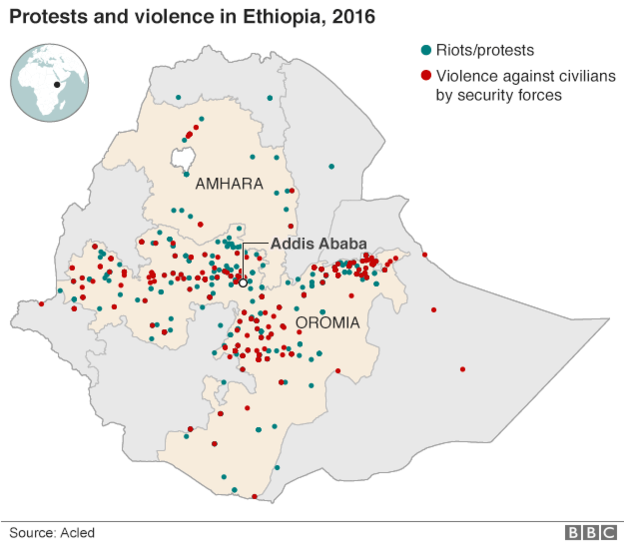 A dispute that started over a football field has evolved into one of the biggest challenges to the Ethiopian state since the end of the civil war a quarter of a century ago. When local officials expropriated the school pitch for developers, students took to the streets of Ginchi, a small town 80km from Addis Ababa, the capital. Their protest was swiftly put down. But the incident was symptomatic of a wider collision in one of Africa’s fastest-growing economies as the government seeks to transform a predominately agrarian society through industrialisation, commercial farming and urbanisation. The Ginchi protest was the first spark in an outpouring of opposition to local and federal government in which at least 140 people died between November and last month, according to human rights groups. 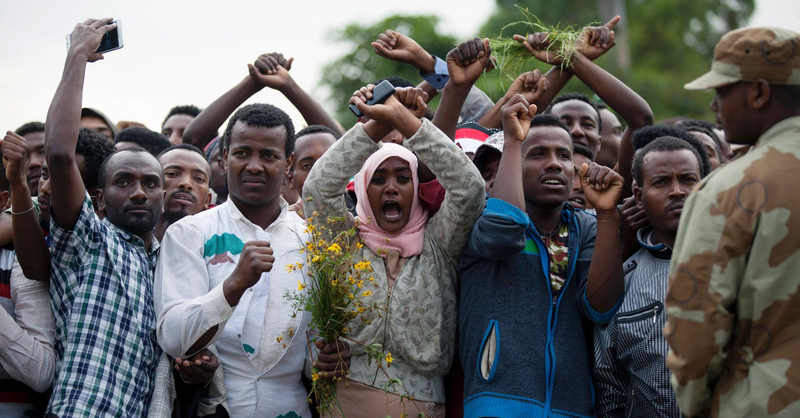 The protests spread across Oromia state, home to millions of subsistence farmers from the Oromo, the largest group in Ethiopia’s federation of ethnic nationalities. Their anger was directed at local governments affiliated with the ruling Ethiopian People’s Revolutionary Democratic Front (which with its allies controls all 547 seats in parliament) because of perceived corruption plaguing land deals as speculators surf rising property prices in towns around the capital. At the same time they accuse the federal government of riding roughshod over local sensitivities with a plan to extend administration of overcrowded Addis Ababa into Oromia, which surrounds the capital. 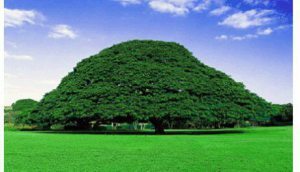 “The master plan is about taking Oromia land and expanding Addis. It will create job opportunities but not for the farmers because their land is being taken,” says a labourer in the satellite town of Sululta. Sululta, where factories and new housing developments encroach on traditional farmland, was one of about 30 Oromo towns that were the scene of mass protests in December. Peasant farmers pouring down on horseback from the hills to join protesting students were met with tear gas and bullets. Elsewhere police stations and symbols of the state were attacked. In some isolated incidents so were private businesses. “They are giving permission [to build] for the people who are rich but they are not giving permission for poor people,” said a farmer near the town of Chancho. He had been unable to obtain a permit to build a house for his son on his three-hectare barley plot, and had one mud construction torn down near a towering cement plant. Another farmer said he was given tiny compensation when compelled to surrender land to local officials who sold it on. Such parochial grievances conflate with broader frustration among the Oromo at the perceived dominance in federal institutions of the Tigrayan ethnic group. 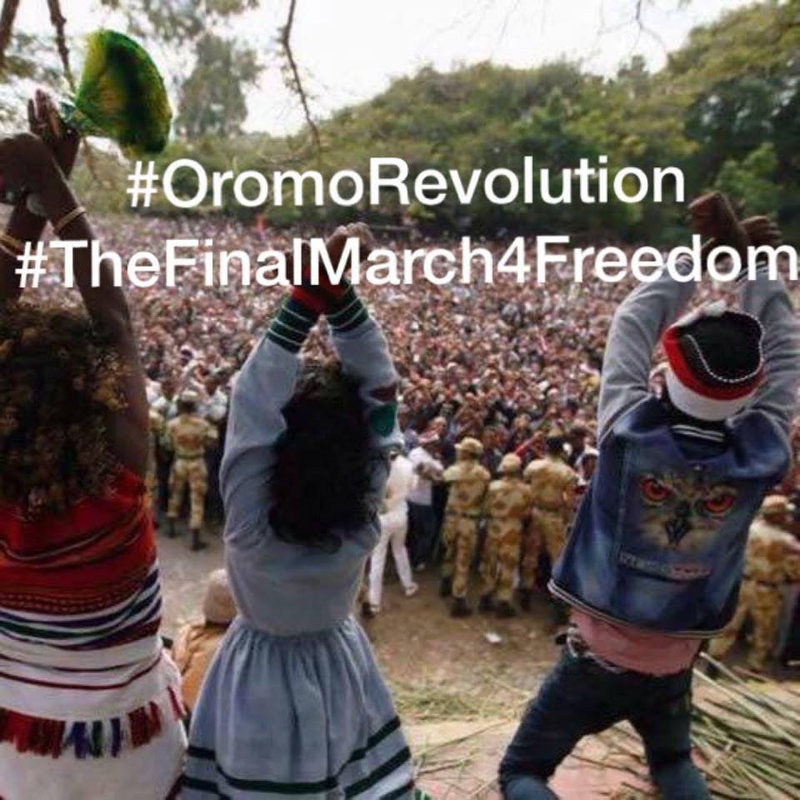 Oromos make up about 40 per cent of Ethiopia’s 90m population, Tigrayans, who spearheaded the 1991 revolution, about 6 per cent. “This is a popular uprising against political marginalisation, non-representation and corruption,” says Merera Gudo, head of the opposition Oromo Federalist Congress and one of the few senior members of his party not under arrest. The government a month ago shelved the blueprint to expand Addis. Since then an uneasy calm policed by security forces has settled over the region. 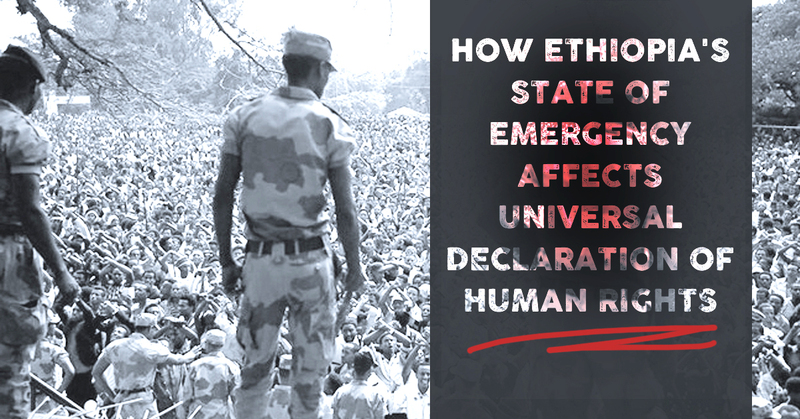 But the episode has exposed a fundamental contradiction in the way Ethiopia is governed — between the federal state as enshrined in the constitution and the reality of centralised, authoritarian power. “The master plan was intended to co-ordinate planning between Addis and satellite towns . . . Infrastructure would be developed, bottlenecks in housing addressed and the dynamic of the economy maintained,” says Arkebe Oqubay, a minister and former Addis mayor who acknowledges there was insufficient consultation with those likely to be affected. “It left room for misinterpretation and proper explanation has not been done,” he adds. Abel Belete, a political analyst in Addis, says it was unprecedented for Ethiopian authorities to back off in this way under popular pressure. “It is a sign of weakness,” he says. Despite the climbdown, underlying tensions remain, with the population appearing cowed rather than persuaded. “Thinking for the people and thinking for the country are very different. You can stamp on the people and still promote the country,” says a young Oromo professional who was afraid to speak openly for fear of arrest. He recognises efforts by the government of Hailemariam Desalegn, prime minister since 2012, and Meles Zenawi, his predecessor, to deliver services, create jobs and invest in infrastructure. But like many of the 100,000 graduates emerging from new universities each year, he wants greater democratic rights and opportunity. “We are not free to express ourselves. That means people are not involved in the development process,” he says. Ethiopia’s semi-authoritarian government has fostered some of the fastest economic growth in Africa while resisting liberal market orthodoxy and giving the state a central role in development. It is an experiment keenly watched by other African governments more constrained by democratic process. 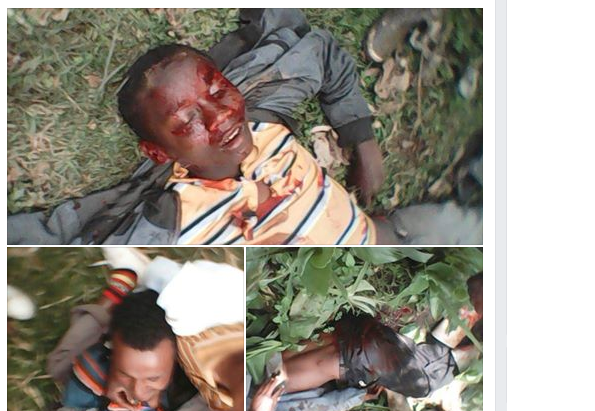 But the Oromo protests are interpreted by some observers as one sign that Addis Ababa’s strategy also has limits. “Ethiopia is undoubtedly fragile even if the underlying state is strong,” says an Addis-based diplomat from the region.